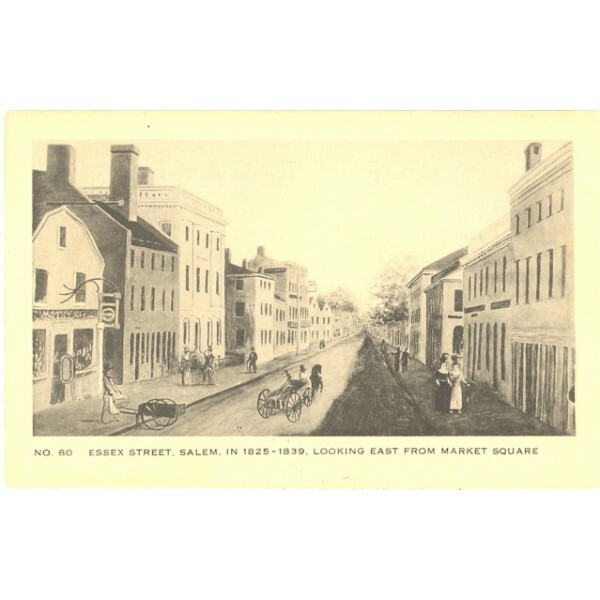 Essex Street has been Salem’s main street since its foundation. The architectural diversity of the streetscape in its residential sections is amazing, and in its heyday (before the building of the Northshore Shopping Center in 1958) its commercial blocks drew people from all over the region. 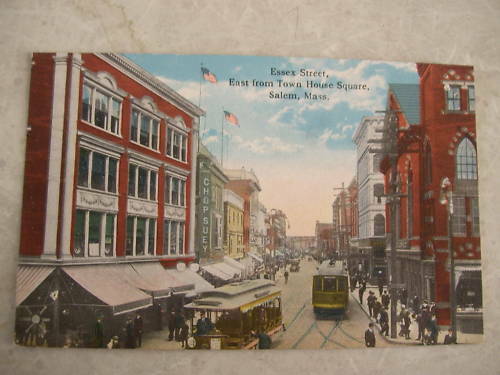 I think there must have been several Essex Streets for some time, but this partition was formalized with the creation of the Essex Street Pedestrian Mall in the 1970s–barring cars from the city center. 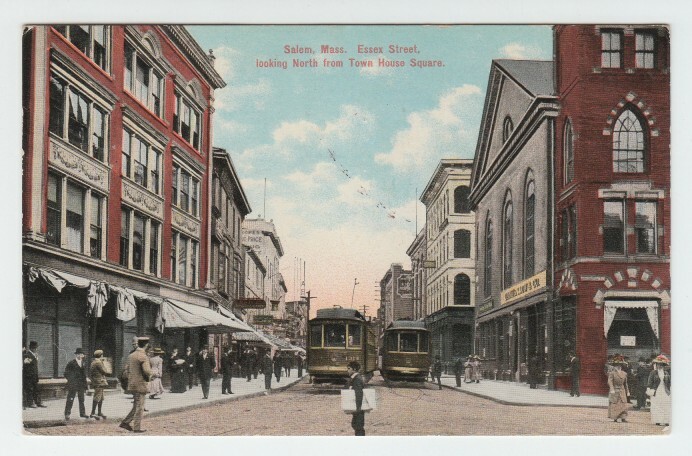 The attitude of Salem’s residents towards the mall strikes me as rather intense; people either love it (or love the concept of it but think it needs updating) or hate it, and that’s why I’m looking forward to tonight’s “Essex Street Pedestrian Mall Visioning and Conceptual Design Meeting“. 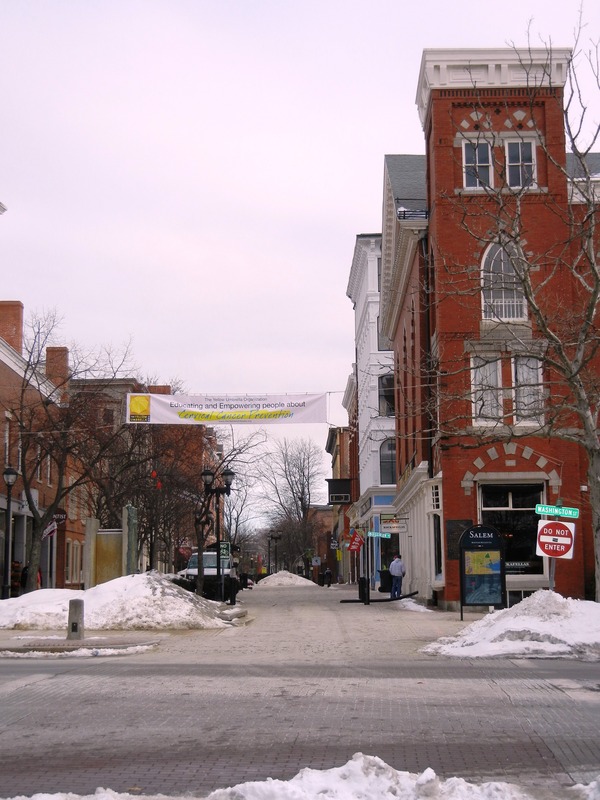 This is the first of four scheduled public forums on the street’s rehabilitation and potential redesign sponsored by the City of Salem, the Salem Partnership, and the Peabody Essex Museum. 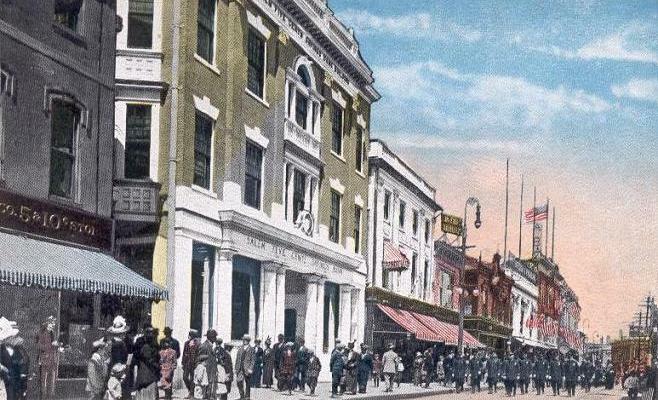 For some historical perspective on this envisioning process, here are some images of central Essex street, past and present. 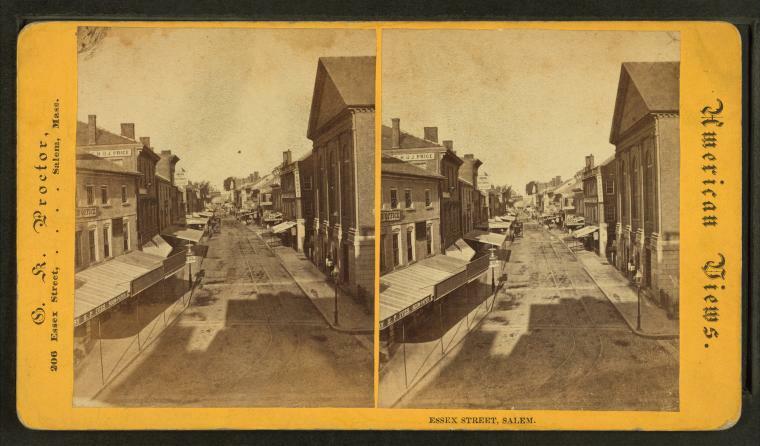 First up are two stereoviews produced by George K. Proctor of Salem of Essex Street from Washington Street or Town House Square and one of the East India Marine Hall further down the street. These were published in the 1870s and 1880s and can be easily accessed at the New York Public Library’s Digital Gallery. 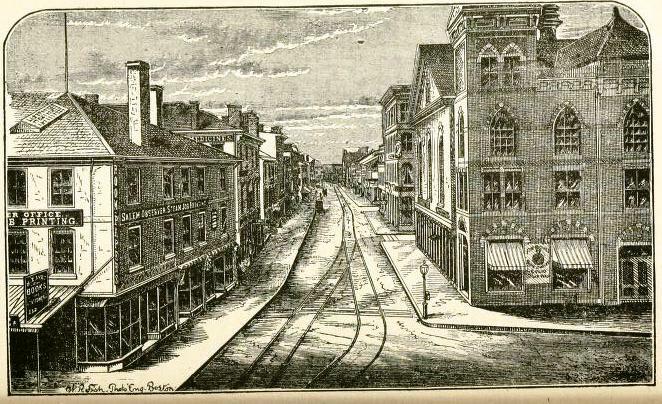 The most popular perspective, from Washington Street across from the Daniel Low building, looking east along Essex Street from the 1880 Visitors’ Guide to Salem. 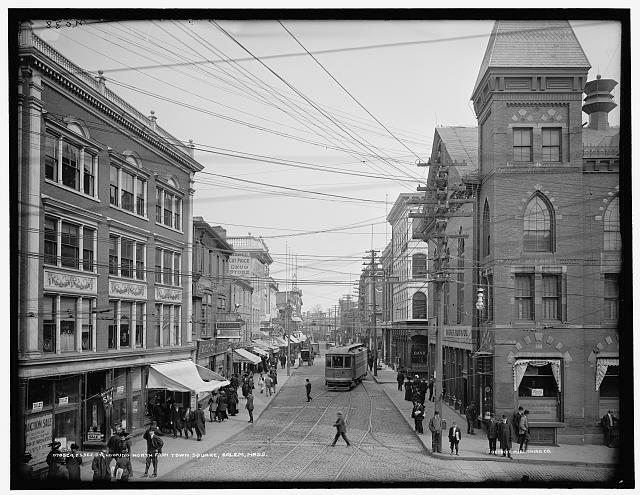 WIRES AND TRACKS: a very connected Essex Street below, again viewed from Washington Street/Town House Square, in a photograph issued by the Detroit Publishing Company in the first decade of the twentieth century(Library of Congress Digital Collections). 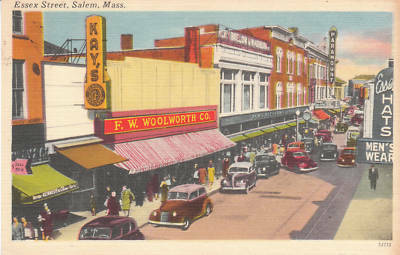 BUSTLING BUSINESSES: A series of postcards, all dating from the early and mid-twentieth century. 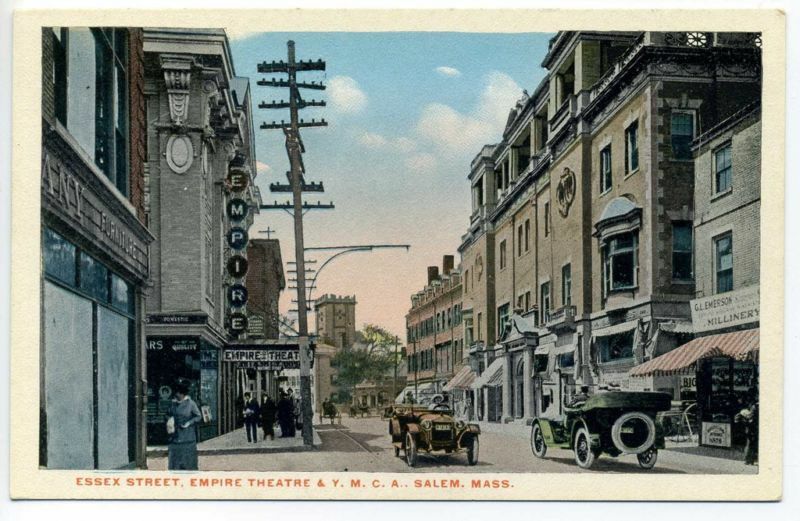 Salem had at least three movie theaters along several blocks of central Essex Street, all gone now, but fortunately we have the Cinema Salem on Church Street. What I notice most about these postcards are big stores (Woolworth’s), signs (Chop Suey! 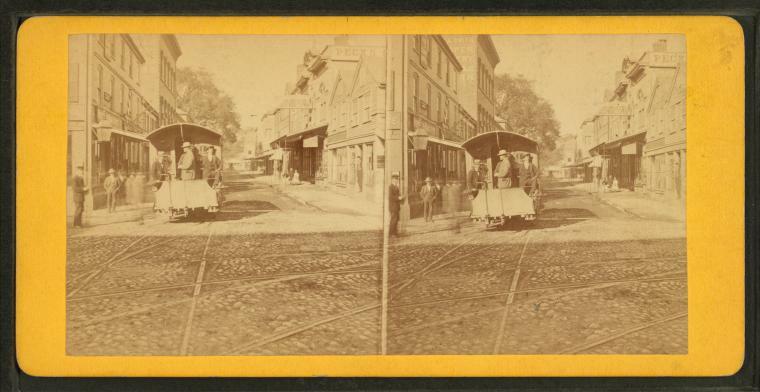 ), awnings, and crowds. 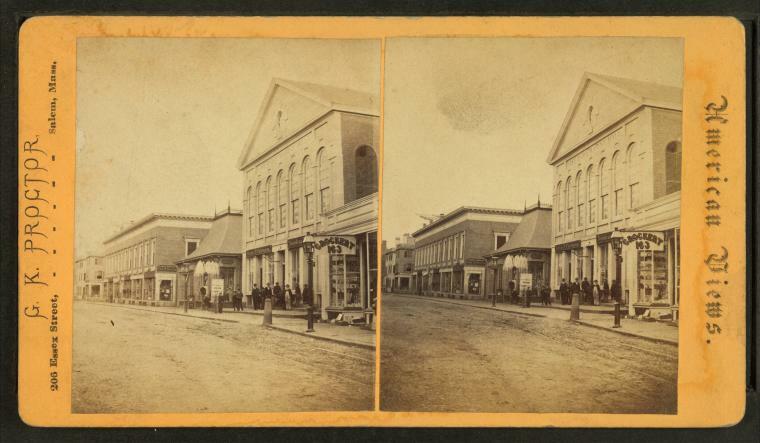 Two views of Essex Street in the present, from the perspective of the silly Samantha-from-Bewitched statue in Town House Square. 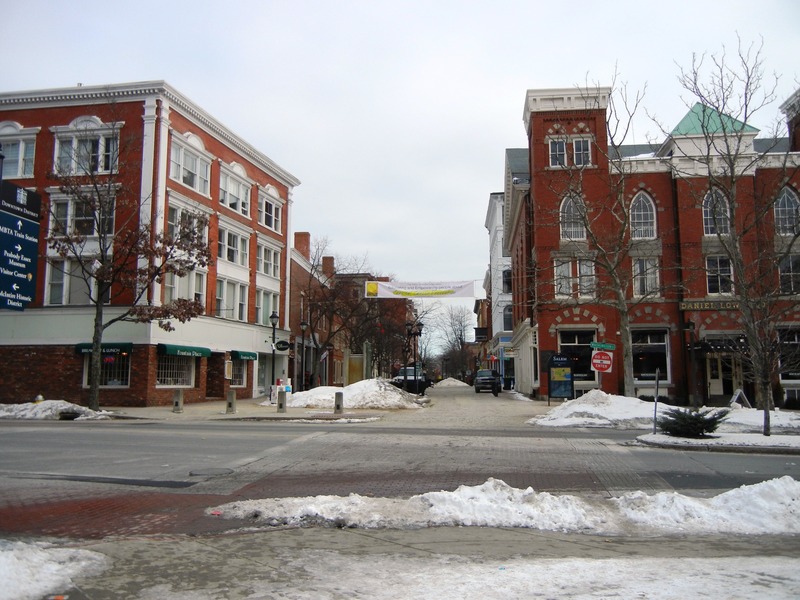 Note that the pedestrian mall is not closed to all cars. This entry was posted on Tuesday, January 11th, 2011 at 1:22 pm	and tagged with ephemera, urban planning and posted in History, Salem. You can follow any responses to this entry through the RSS 2.0 feed. I’m loving the citations to all of the images, Donna. Another fun thing to do would be to include a list of businesses on Essex Street, available in the city directories of the late 1890s. 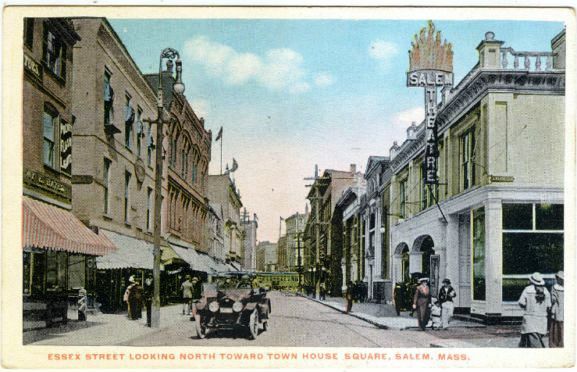 I’ve got some cool maps of Salem in the 1700s and 1800s, if you want to see/post them. Thanks, Brad. Definitely going to do a maps post at some time, but first I want to do trade cards, keeping with my interest in ephemera. There are so many—and they definitely give you a good impression of just how busy Salem was. I love comparing old images with new photos. I see that the mansard-ish caps have been taken off the large brick building with the Gothic windows. It would be nice to see those be restored. Very fun post. Hi Donna, Ithaca NY where we moved from is going through a similar love/hate relationship with their 1970’s pedestrian mall on their main downtown street. They hired Sasaki Associates to aid in public hearings, which led to the city deciding to keep the mall pedestrian and redesigning it more like the one in Charlottesville Va. with an open center for movable restaurant seating. And my favorite pedestrian mall is Munich which works very well. Anyway, your website looks great. Thanks for your helpful comments, Anton. At the meeting last night several people brought up more workable pedestrian malls in Europe but no one brought up Charlottesville—got to check that out. It seemed to me we spent most of the time talking about COBBLESTONES, for and against. Wow. Thanks so much—elegant, coming from you, means a lot as does this boost early in my blog’s life! Back. I also meant to add that since I remember Salem as far back as the sixties, I particularly dislike the way they pedestrianised the area. It has the odd effect of deadening and disconnecting the area, which is funny, as so many actually work. Just sadly, not Salem’s.